A blood-chilling action-packed thriller about modern day vampires unlike any previously encountered. 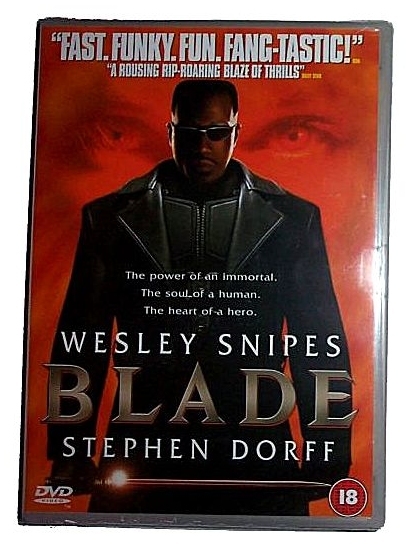 Wesley Snipes is BLADE, the ultimate vampire hunter, an immortal warrior who posesses the superhuman strength and cunning of a vampire but shares noneof their weaknesses. Able to walk by day and stalk by night, Blade must confront his ultimate adversary, the omnipotent vampire overlord Deacon Frost, Stephen Dorf, who is intent on leading an underground legion of vampires to conquer mankind.Blade must use his awesome powers and razor-sharp weaponry like never before to prevent the annihilation of the entire human race. 18 Suitable only for persons of 18 years and over.